Playing with Flour: Easy bagel recipe! I found my first 2018 baking inspiration in the form of these incredibly easy - and tasty - homemade bagels! I first saw them from Skinnytaste's Instagram account and when she posted the recipe, I barely waited a day to try them. 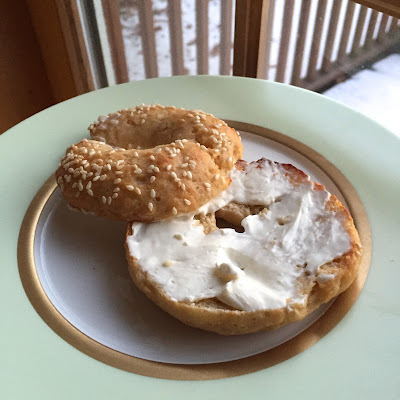 If you like bagels and wish you could eat them more often (like me), you'll surely be tempted because they are practically 2-ingredient bagels that takes very little time to make from scratch! Even if you don't use self-rising flour and break down the components (adding baking powder and salt yourself), you only need 4-5 ingredients: flour, baking powder, salt, non-fat Greek yogurt, and an egg white to brush the top with, plus any optional topping you might like on them. I had everything I needed to make these without going to the grocery store. It sounds incredible but really, it works and it's tasty to boot! Did I also mention, they're only about 150 calories each, with 26.5 grams of carbs? I don't know about you but though I adore bagels, I don't eat them very often as I try to watch my intake of refined carbs. Making them myself and having this lighter option is a fabulous discovery. Not to mention...I made bagels! How neat is that! For my inaugural batch of bagels, I used 2/3 all-purpose flour and 1/3 white whole wheat flour. Next time (and there will be plenty of opportunities), I plan to increase the whole wheat proportion further. The non-fat Greek yogurt is key. They work some kind of magic so that the bagels turn out with a nice soft texture and have a slightly tangy, salty bite. These are not the traditional super-dense, heavy bagels. My bagels were still very soft inside after 2 days sitting at room temperature. I toast them up and they're good plain, with butter, cream cheese, and almond butter - to name a few options. All I can say is if you enjoy bagels and want a lighter option, try making these very easy ones! These are going to have a place in our breakfast routine from now on. I think that's a pretty great way to start of the new year in the kitchen! Here's how easy it is to make these bagels...the dough comes together in a flash, you shape them, and pop them straight into the oven. No yeast, no wait, no boiling, etc. Add a cup of 0% fat Greek yogurt into the dry ingredients. Stir together until you see crumbles. Turn the mixture out onto a floured surface and gather the dough together. Knead it about 20-25 times. The dough should be a little tacky but not super sticky at this point. Divide it into 4 portions (this makes 4 bagels but you can double or divide the recipe with ease). Roll each out to about a 3/4 inch thick rope. You get the hang of it pretty quickly. Then just shape it into a round bagel shape. It is a little tricky to get the rope to join so try your best to connect the ends together but don't be surprised if they don't bake up perfectly round (it's not a big deal to me). Lastly, set them on a lined baking sheet (spray your parchment and even silicon with a little baking spray to make sure they don't stick). Brush the bagel tops with egg white and sprinkle them with whatever topping you like. Sesame bagels are my favorite so I used sesame seeds. Many people are opting for the everything bagel seasoning available at Trader Joe's. Bake them at 350 degrees for 22 minutes, then, leaving the bagels in the oven, turn the temperature up to 550 and bake for another 5 minutes so they brown a bit more. Here's how they turned out! I was so excited! They are firm on the outside, soft on the inside, the bottom is nice and crusty dark. I made them in the afternoon and couldn't wait to sit down to homemade bagels the next morning. My whole family and I had them and everyone gave them a thumbs up. This bagel recipe is truly easy and really worth trying! Update (Jan. 23, 2018): I made another batch today, following some recent minor adjustments made to the recipe by Skinnytaste. For this, I used 1/2 cup of all-purpose flour and 1/2 cup of white whole wheat flour. The amount of baking powder was increased to 2 tsp (from 1 1/2 tsp) and the baking process was streamlined to bake at 375 degrees throughout on an upper rack. I've adjusted the recipe below accordingly. The bagels on the left were shaped as discussed throughout this post using the rope method; the bagels on the right were shaped by rolling the dough into a ball, then pressing a hole in the middle and stretching the dough out. I don't think I have a preference. Optional topping: sesame seeds, poppy seeds, everything bagel seasoning, etc. Preheat oven to 375 degrees with a rack placed in the upper third position. Line a baking sheet with parchment paper or silicon baking mat. Lightly spray with cooking spray to avoid sticking (especially if using parchment paper). In a medium bowl, whisk together the flour, baking powder, and salt. Add Greek yogurt and mix with a spatula until well combined and you see small crumbles. Lightly dust a clean work surface and turn the dough out on top. Knead the dough until it is tacky, but not sticky, about 15-20 turns (you could also knead it right in the bowl). Divide dough into 4 portions. Roll each into 3/4-inch ropes and join the ends to form a round bagel shape. Or you could make a ball, press a hole in the center (I find dipping your thumb in flour works well), and then stretch it slightly. Place bagels onto the prepared baking sheet, spaced apart to allow room for expansion. Brush with egg wash and sprinkle with toppings, if using. Bake for 25 minutes on the upper rack. Remove from the oven. Let bagels cool on a wire rack. You can keep the bagels in an airtight container, at room temperature (or refrigerate), for up to 3 days. To freeze, slice bagels in half and wrap individually; reheat in the oven or toaster. Awesome! Quick, and really healthy too, Monica. I love it for those very reasons. Thanks! Hi Monica. I've never commented before. I'd like to wish you a Happy New Year! Your blog is the only one I'm subscribed to! Do you think it would work if I used wholemeal flour? Thank you and Happy New Year to you as well! As for these bagels...if I'm not mistaken, wholemeal flour is the same as what we call whole wheat flour. And yes, it would work. Gina from Skinnytaste has tasted it with all whole wheat flour and I used 1/3 cup of whole wheat flour as well. Next time, I plan to use all whole wheat or at least ramp it up some. Should be great. Wow!!! and wow! I cannot wait to try these and have all the ingredients on hand. I can't believe you don't have to boil the bagels and wait for the yeast to rise, etc. This is a fantastic discovery - thank you so much for sharing. Sesame bagels are my favorites too. Great recipe Monica! Happy weekend. Isn't it exciting, Tricia?! I'm so glad you share my awe of these bagels. I couldn't believe it and had to try it...and honestly, it works and I enjoy the taste and texture. Hope you try it soon and like it as much as I do! Have a great weekend. Homemade bagels sounds an awesome idea, Monica! I love bagels but I don't eat them often for the same reason as you, too many carbs, fat... I read in a diet book once, that if one has to have a bagel, half of it should be more than enough and then with only salad on top... kind of taking the joy out of it. This version sounds great, I should give it a try! You're right...all these restrictions really do take the joy out of it. I'm all for just eating the real deal and enjoying it when the craving hits - everything in moderation - but I'm also all for finding healthier alternatives that are just as good that I can have all the time. I hope you try this. I'm off to make another batch within the week! So delighted to see your post and and its one of my fav comfort food! Keep sharing your best and look forward to your future creations and write ups. Many thanks and Happy New Year! Wow no boiling in hot water first. That is a great time saver. Hope you are having a super start to 2018! I know and it tastes great. Wonderful shortcut and something lighter than the usual bagel. Happy New Year Monica! These look so good. I can't believe how light and easy they are. Definitely a keeper. Same to you! This is definitely a keeper, Sonali. I've been busy but plan to make another batch soon!